Recipe courtesy : My karnataka friend, an energetic and diplomatic lady and a wonderful cook, nearing 70. I have tasted some of her food. Most of her dishes retain the authentic flavour of Karnataka cuisine. I tried it, as mailed by her and needless to say it was awesome. LG Asafoetida (Hing / Perumkayam) - 1/4 tsp. Fry the ingredients separately to golden brown with little oil in medium flame. When cool, grind the fried ingredients along with dry coconut to a fine powder. Store in airtight container and use when preparing the bhath. This powder can be stored in refrigerator for 15 days. nice idea of dry masala. useful informative post.I usually end up using M T R Vangi bath powder which is also very tasty. why only vangi baath? This will add flavour to many rice dishes too. I am already dreaming of dishes to make. After a long back again in your blog... feeling very nice. Thanks for remembering me. Vangi Bath looking so yummy and spicy... must be very tasty. 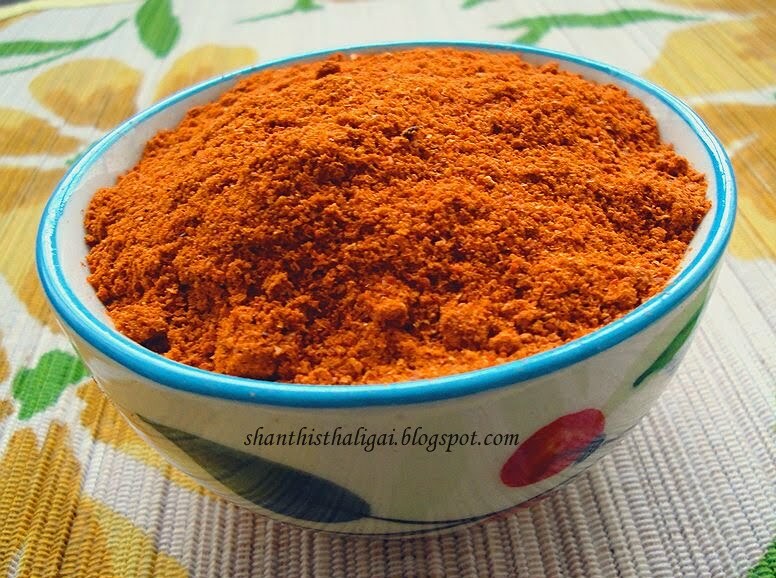 I can cook anything with this flavourful powder..